Soak the bulgar wheat by covering it with boiling water and leaving it for 15 minutes in a small bowl. Drain the bulgar thoroughly, pressing the water out in a sieve and put it in a bowl with the minced lamb. Add the dried mint and oregano, mince in the garlic (I just grate it with a fine microplane) and the lemon zest. Stir everything thoroughly and then form into small walnut-sized patties, then flatten them slightly between your hands and arrange them, as you go, on a clingfilmed baking sheet or plate and let them stand for 20 minutes in the fridge to firm up. If you want to, you can cover them with clingfilm, too, and leave them in the fridge for up to 6 hours before frying them. I get, by the way, about 34 patties out of this mixture. Fry the patties in a little olive oil until cooked through, and a beautiful golden brown on both sides. These are little, so it shouldn’t take too long: I’d reckon on about 4 minutes a side. The important thing is not to crowd the pan as you cook. To make up your sandwiches, roughly proceed as follows. Toast or otherwise warm each pitta bread and cut a strip off one long side to open it, then stuff it with a salad of shredded lettuce, chopped mint and half-moons of red onion rings. 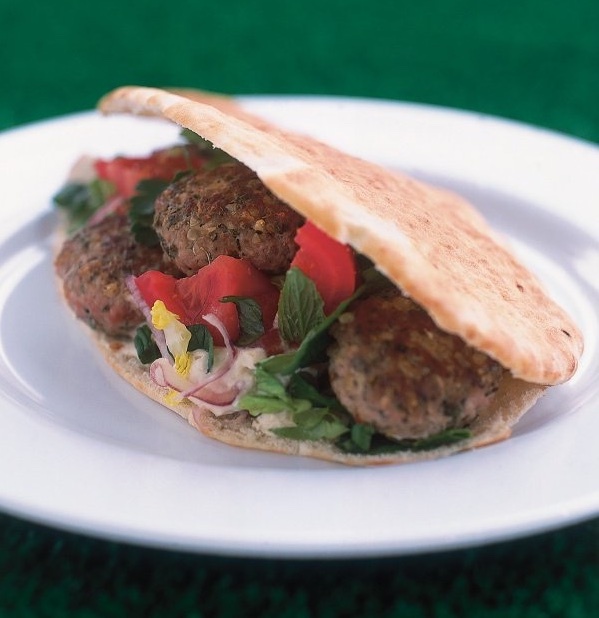 Dollop into each gaping pitta (and you can do this before or after the salad stage actually) a couple of tablespoons of hummus mixed with 1 tablespoon Greek yoghurt and a pinch of ground cumin. Cram with four or five lamb patties, then squeeze in half a tomato roughly chopped and give a good spritz of lemon juice. Merhaba from Ozlem’s Turkish Table!